It is important to pay attention to the correct tagging procedures when tagging sheep. Generally sheep should not be tagged when fly strike is likely. Therefore we would not recommend tagging sheep during the warmer months. Tagging at birth is recommended; however it is appreciated that not all flocks can be tagged at birth, especially hill flocks. The tag should be inserted in the middle/lower ear, 1/3 from the head and 2/3 from the tip of the ear. One third of the tag should show below the ear. This point of the tag should go in from the outside of the ear ending up on the inside of the ear when applied. 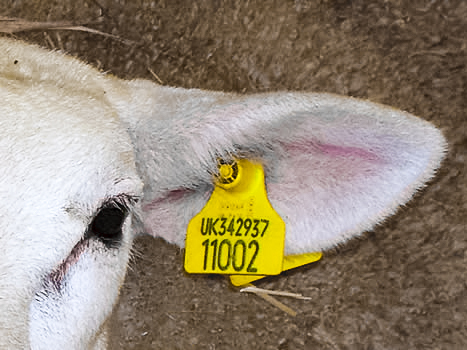 The female part of the tag should always be placed at the front of the ear. Adult stock should be tagged from the backward ear position and the tag then rotated 180° to the correct position facing downwards. Small animals can be tagged from the forward position – this will avoid the need to rotate the tag.